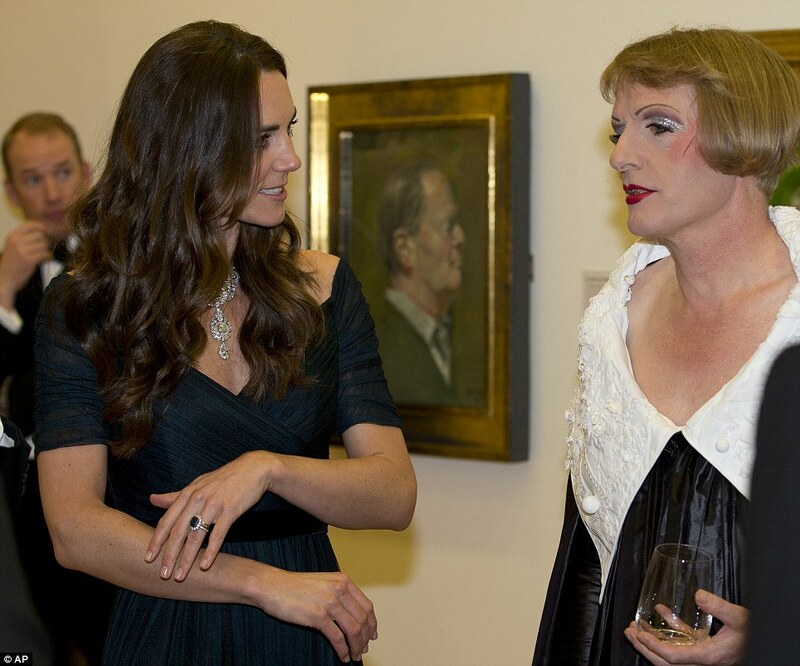 One of the Pen Portraits was created by Hilary Mantel—the Man Booker prize winning author—who called Kate a “shop-window mannequin” last year. She was heavily criticized for that, even though she was totally correct. I guess Mantel didn’t attend the gala. I wonder why. It’s too bad she didn’t, a run-in with Kate would have been amazing. Maybe that’s why she didn’t go, she didn’t want that run-in, or someone in Kate’s camp asked her not to go. What a shame. Some notable people in attendance were photographer David Bailey, Olympic Gold medalist Katherine Grainger, transvestite potter Grayson Perry, actor Alan Rickman (omgs!) and artist Jonathan Yeo. Elizabeth Hurley was also in attendance. She looked fabulous! I haven’t seen a video of the speech, but apparently Kate’s voice faltered toward the end of the speech and the audience said “Ah” in sympathy before she regained her composure. She really should be better at public speaking by now. She should have had lessons or something. Now on to the all-important fashion and jewelry segment of this post: Kate wore an ink blue Jenny Packham gown that she wore to the 100 Women in Hedge Fund’s dinner last October. Meh. I mean, I do think this gown is pretty—and one of the prettiest gowns Kate has worn (but that’s not saying much because I’m not a huge fan of Kate’s style)—but it just doesn’t wow me. It’s a pretty gown, but it doesn’t have that wow factor. Also, it’s a repeat, so blah. At least it’s not that damn black lace Alice Temperley dress she’s worn three times—I am not a fan of that dress at all. I guess I shouldn’t be criticizing her repeats—that dress was something like $6,000 after all—but for a gala dinner that is so formal, where she was wearing a Royal Collection necklace, I would have expected something new. Onto jewelry: Kate wore earrings she’s worn a number of times that are believed to be a gift from Prince Charles. I’m not sure if she wears them so much because she’s a huge fan of them—I’m not, they’re not that pretty—or because they are the fanciest earring she has. Let’s be real, her jewelry game isn’t that great. My only complaint is that Kate’s hair got in the way of the beautiful necklace. She really should have put her hair up in an elegant updo—especially since this was a “black tie with a touch of sparkle” affair. Also, during her speech, her hair got in the way again. Other than the tiara on her wedding day, and the tiara from some reception in December, this is the first time the Queen has lent Kate any significant royal jewelry. I guess Liz wasn’t fond of Kate wearing a cheapy necklace—that everyone could run out and buy—to that premiere last December. This must be part of the “princess makeover” we’ve been hearing about. I’m sure Kate was thrilled that she got to wear such a beautiful and expensive piece of jewelry. 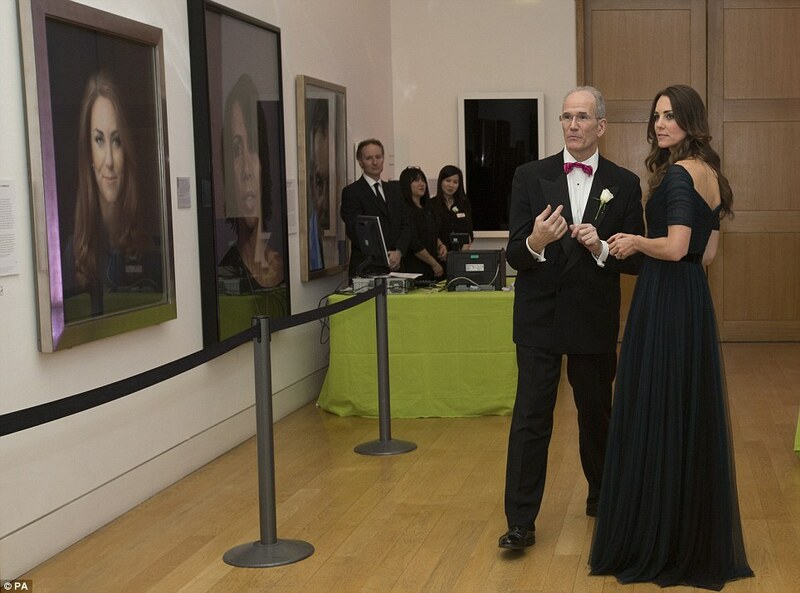 Randomly, here’s a picture of Kate standing in front of her portrait. I wonder what she really thinks of it. Full view photo of Kate from Twitter. Close up photo of Kate from Daily Mail. 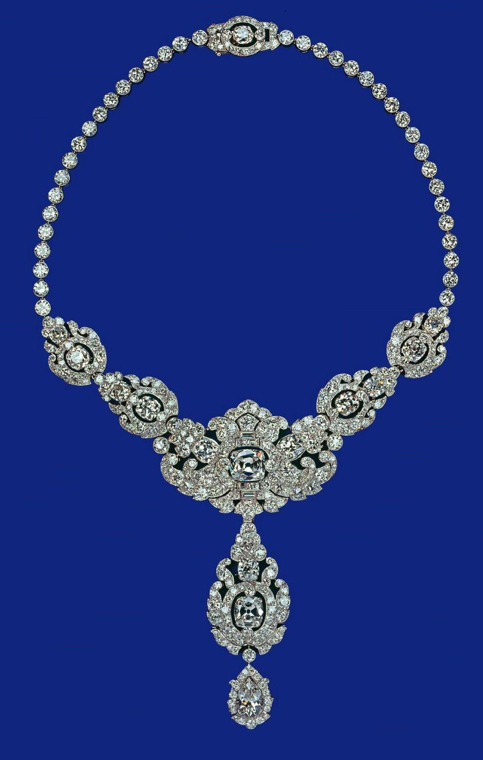 Photo of necklace from the Royal Collection website. Good grief! Why didn’t Waity have the sense to wear her hair up with this necklace? I just don’t understand her fetish with wearing her long hair down on all occasions. She should have worn an updo. That necklace screams for an empty neck! All the money in the world can’t buy good taste and class. Someone on another blog said that Waity doesn’t wear her hair up because she has extensions of some kind. I’ve only seen her hair up ONCE since she became Duchess. And it was a low pony tail. Otherwise her hair looks the same every damn time she is out. She seems so damned boring, no wonder William is away from her more these days. Girl, when the Queen loans you her magnificent diamond necklace, you should learn how to bring it home by displaying it to its best advantage. Why wear your hair in your usual cocker spaniel style that continually gets tangled in your collar, er, necklace? Have you no sense of occasion? Do you realize what you’ve got around your neck? This is an important statement piece that deserves to shine fully exposed, not obscured by your messy tresses. Gah! Give it to me and I’ll show you how to wear it! And for practical reasons as well, her hair should have been pulled back if she was going to make a speech, not flopping forward as usual so that she has to tuck it behind her ear like a 10-year-old girl. She lacks such sophistication that after 3 years of marriage is no excuse given all the resources at her disposal. It does not look to me that the RF have any plans of getting rid of Kate and the Middletons. It looks as though the Queen is accepting her (letting her wear that necklace is nauseating, does not deserve it) and trying to push her down everyone’s throat. Kate is not likeable much less lovable like Diana. She never will be. I say if you are going to keep her around, then keep her hidden from the public. She is a big turn off for Britain and the wicked Windsors. Camilla sure loves the jewels, but I think Kate will start a new trend. I don’t see her busting out the crowns and adorning her neck with jewels on a regular basis, even in 20 years. Camilla’s love of big jewelry is one of (maybe the only?) reasons I like Camilla. I don’t think Kate is much of a jewelry person. She has never really worn any sort of statement jewelry before marriage, and the only times she’s worn any big pieces after the marriage she hasn’t worn them correctly (keeping her hair down and covering the jewels).